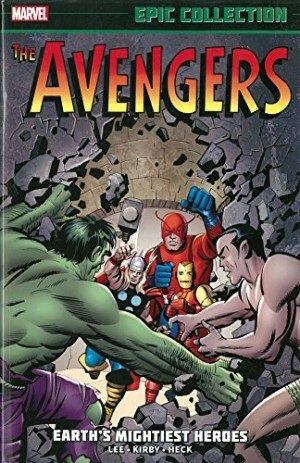 This Avengers collection covering issues from 1976 and 1977 is a hodge podge of inconsistency, with artists and writers changing all the time. 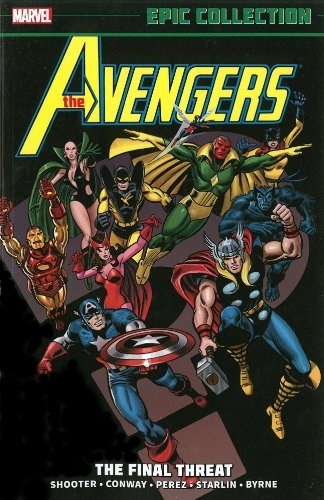 There are three highlight sequences among the twenty issues and annuals reprinted here, four if the good opening story of the Avengers changing their line-up is included despite being interrupted by a reprint. That comes in at just over half the content, but some of the remainder is so mediocre it drags the rating down considerably. The undoubted star of the collection is George Pérez, responsible for drawing almost half the pages, who begins it becoming ever more interesting in conceiving page layouts really emphasising exciting superhero action, yet still packing in detail and effective character moments. By the end he’s still not become the full Pérez, but this is innovative and enthusiastic art. Balanced against it are contributions from Don Heck and George Tuska, neither very interested in the material. 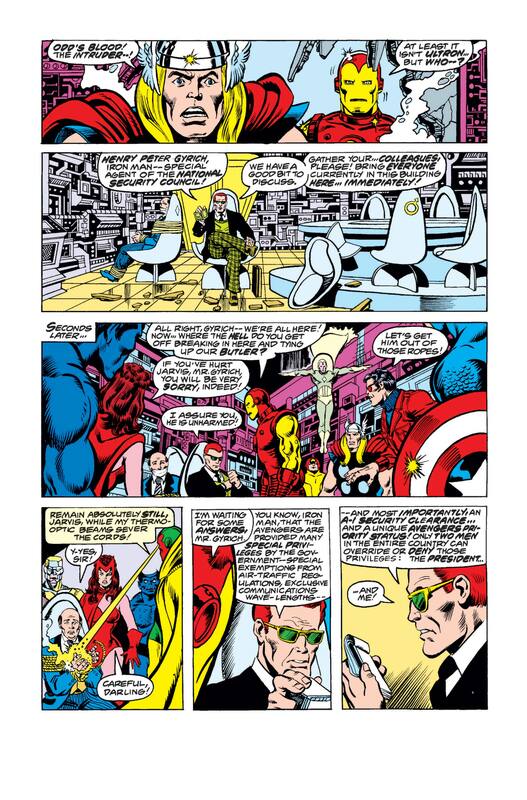 The most surprising art is by Jim Shooter, who also writes half the content, and two of the standout sequences. One mixes the Grim Reaper, Wonder Man, Ultron, Yellowjacket, the Wasp and the Vision to good effect as the Reaper investigates his brother’s return from the grave and Ultron decides he really needs a wife and conceives an unusual method of achieving it. 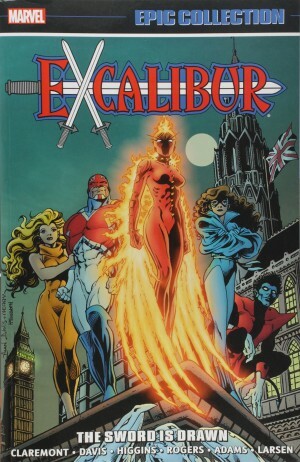 It’s dated by the thought balloon exposition, but the plot more than compensates. 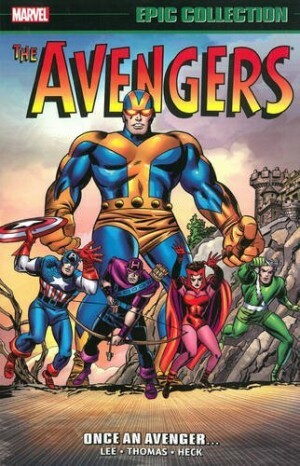 Lacking the torturous emotional connections, but very enjoyable is Shooter uniting three old Avengers villains with John Byrne enjoying the fun to produce some great pages of art. Entirely different in tone and the collection’s overall highlight is Jim Starlin bringing Warlock’s story to a close over two extra-long tales, throwing in the Avengers, Spider-Man, the Thing and Thanos. For maximum impact it’s better read as the conclusion to The Complete Warlock by Jim Starlin, but even in isolation it’s an exciting and unpredictable story, even if you’re well aware that Warlock had a long career ahead of him at Marvel. 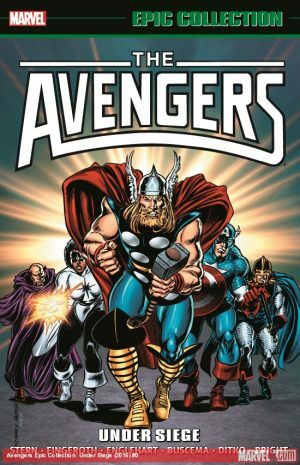 Steve Englehart opens the collection, having concluded an epic in The Serpent Crown, introducing what would become a familiar and always enjoyable scenario as the Avengers decide on a new line-up. It’s juxtaposed with media speculation, a clever way of sustaining tension. Unfortunately, deadline problems in 1976 mean it’s also interrupted by a Stan Lee and Heck Avengers story from a decade earlier, which doesn’t sit well in the company. Marvel are dogmatic to the point of infuriation of compounding past mistakes by insisting on the exact presentation of original issues when a more logical move making for an improved reading experience would be to excise reprint content and shunt fill-ins to the rear of collections.